The August/September 2010 issue of Fine Cooking magazine was the inspiration for this rustic dessert. That and a chance meeting at Bristol Farms with a farmer from the Family Tree Farms who had the most beautiful plumcots on display and available for tasting. I selected the Dapple Dandy variety which has green skin speckled with red on the outside and tart pinkish-red flesh on the inside. Plumcots are a cross between plums and apricots and come in a multitude of varieties. In the magazine they used figs and raspberries which would have been lovely, however, I had my heart set on using the Dapple Dandys. You could use whatever fruit mixture you like - apples, peaches, berries etc. 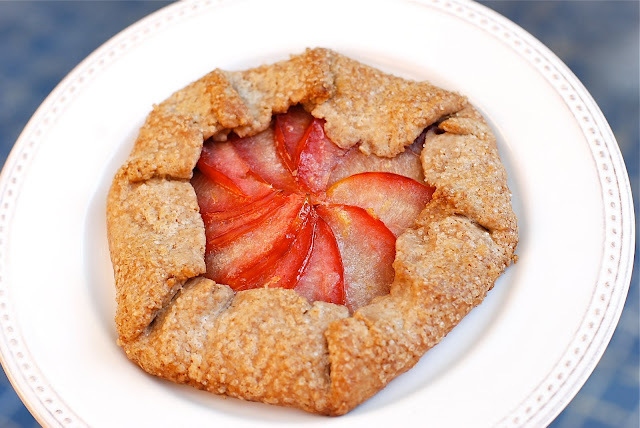 Below is how I made the plumcot crostatas. Put flours, sugar, cinnamon and salt in food processor and pulse to blend. Add butter and pulse several times until mixture resembles course sand. Add 3 Tablespoons cold water and pulse. If mixture seems dry, add more cold water 1 Tablespoon at a time just until dough starts to come together but don't over process. I ended up adding 5 more Tablespoons of cold water, making a total of 8 Tablespoons. Turn the dough out onto your work surface and divide into 4 equal parts. Flatten each part into small round disks, wrap individually in plastic wrap and place in refrigerator for 2 hours or up to 3 days. Reserve the graham crackers to be used later. Mix plumcots, sugar, and lemon zest together in bowl and set aside for about 30 minutes to macerate. When ready to assemble and bake, roll each disk of dough into a round that is about 1/4 of inch thick using a lightly floured rolling pin. In the center of the disk spread 1/4 of the crumbled graham crackers (this will keep the bottom of the crostata from getting soggy). Then arrange 1/4 of the plumcot slices in the center of the disk. Begin folding up the edges of the disk working your way around, pleating as you go. Continue until all 4 crostatas are done. Place on parchment paper lined baking sheet. Brush each crust with heavy cream and sprinkle crust and filling with sugar. Then place one slice of butter in the center of each crostata and bake for 35 minutes or until golden brown. Up at the Russian River, showing off your blog...don't know what's more impressive, your cooking or your beautiful photography...keep the recipes coming! !